The exercise of doing up the space began with a lot of undoing. Taking off wall plastering, demolishing space-fragmenting cubicles, getting rid of the false ceiling, relocating the staircase, exposing the bones… At the end of this exercise the 135-square-foot footprint was augmented by a mezzanine that allowed them to separate the general staff area (lower level) and the principals’ workspace (upper level). “This also allowed us to enjoy the full beauty of the tree. 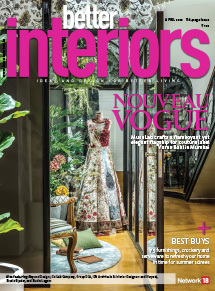 The lower level sees the trunk and foliage, but the full beauty of the canopy is actually enjoyed from the upper level,” disclose the architects. As the studio is accessed by appointment only, walk-ins are minimal. This negates the need for a formal reception area. An anteroom with a high table and bar-style stools functions as a multipurpose area for discussions/reception. A column near the entrance serves as board to display the firm’s many accomplishments. The anteroom — which was created in lieu of a formal reception as this is a by-appointment-only studio — is a multipurpose area. Its casual nature is communicated by its furniture: a high table accompanied by stools. “It serves for a quick chat if anyone does drop. The absence of anything formal discourages needless conversation,” elucidates Anu. The lower level or the staff area has sandfaced plastered walls. The linear footprint was apportioned into three long zones. 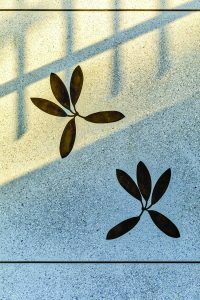 While the two on the side were designated as staff seating, the central one was kept deliberately free of any encumbrances and delineated with thin brass strips inlaid in the terrazzo floor. Within this section were ‘sprinkled’ more inlays, this time in the form of variously shaped leaves. This strategy achieved two things: a clutter-free look and an exaggerated linearity, which was again underscored with the central strip-light which runs through the ceiling. The window at this level is shaded against the bright sunlight. The niche in the ceiling houses an air conditioner. 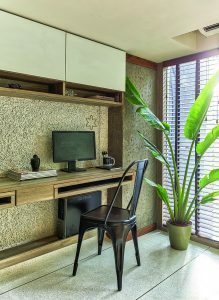 The vibe of the studio is informal and friendly, rendered through materials imbued with high tactile and textural values. Having taken down the old plaster, some exposed brick walls have been simply painted over; others have been finished in sandfaced plaster. Columns and beams, denuded again of plaster to expose concrete, have been machine-polished to grey smoothness. 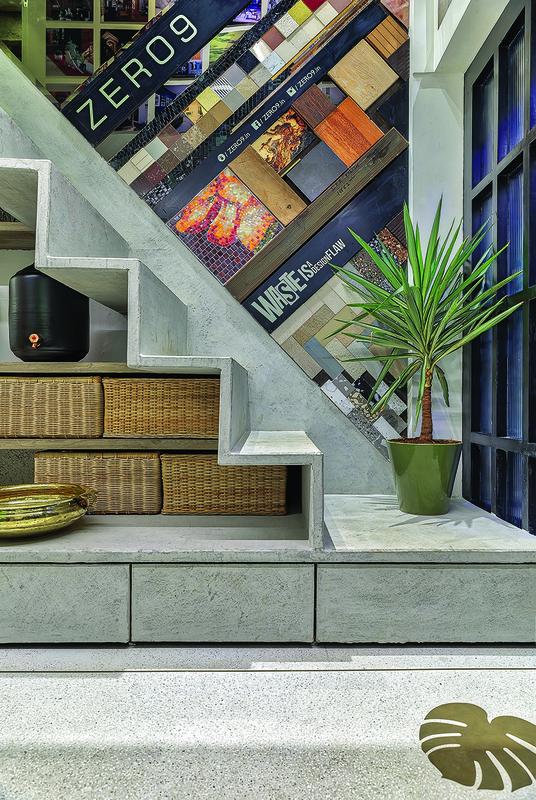 The staircase block, the flooring of the upper level and some parts of its walls are clad in concrete micro-topping to harmonize with the structural members. The ceiling of the upper level has been roughly handplastered in POP. 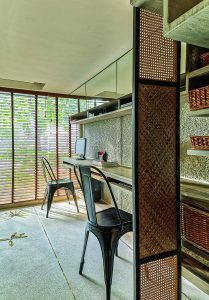 Furniture and some storage units feature woven surfaces. Mirror, used on overhead storage (lower level) and a wall (upper level) to illusorily expand dimensions, adds a counter-point to this rusticity. 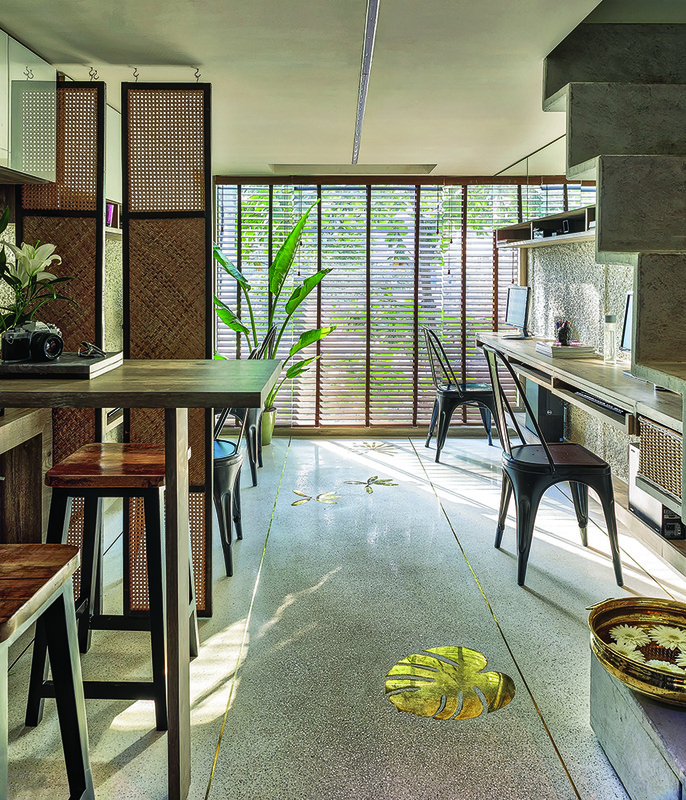 The principal architects’ cabin is housed on the mezzanine, and affords green views of the Indian Almond that stands almost next to their window. 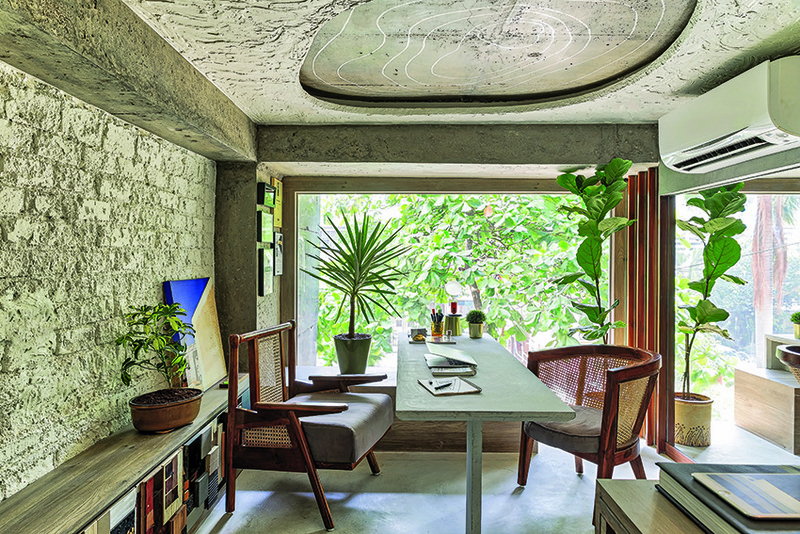 The floor and the desk is lined in micro-topped concrete, while the ceiling is partly hand-plastered and partly machine-polished. The latter portion, which is clad in concrete, has concentric contour-map-like rings which add more visual interest. The design process eschewed waste — and indeed the philosophy is boldly proclaimed on the staircase wall: waste is a design flaw. This is why there are no regular office chairs. “They have too many parts which, when damaged, have to be simply thrown away,” says Anu. “Plus, today’s office chairs are so comfortable that people tend to lounge around in them. We wanted to change that; we wanted an alert staff. So now we have metal chairs instead. They are comfortable, of course, but not so much that staff can slack off,” she smiles. 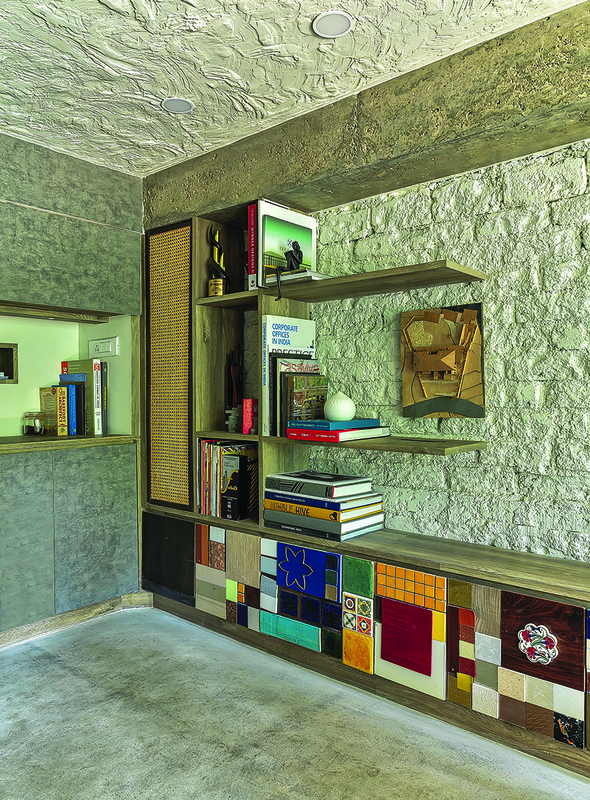 Another shining example of the thrifty approach is the staircase wall — what Prashant calls the ‘sample wall’ — and the shutters of the storage in the principals’ cabin. 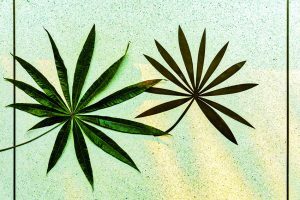 Both use samples collected over the years, now transformed into eye-catching collages. “This is the heart of the space,” says Prashant of the staircase wall. 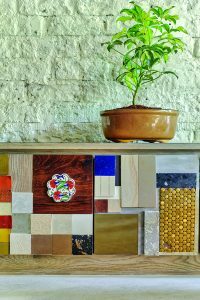 “We wanted a sleek staircase that was more of a hang-out space than a transition element.” The shutters — an eclectic amalgamation of tiles, stones swatches, veneers and the like — are actually mood boards which can be easily removed and carried to client meetings. 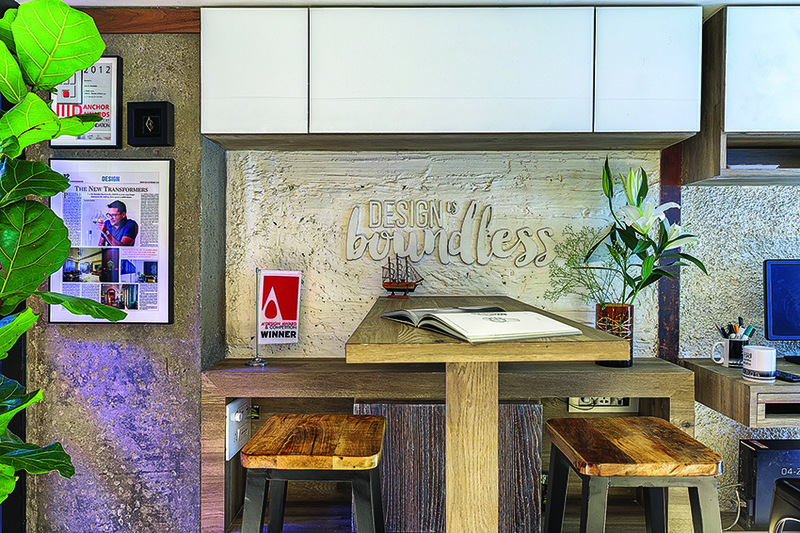 These compositions show the coming together of different materials and textures: the beam is machine-polished concrete; the wall is painted exposed brick; the ceiling is rough hand-plastering while the portion to the left and the floor is topped with a thin 3mm concrete coat. To this, the weave of the long shutter and the collage of sample materials on the shutters of the console-like storage, add another visual overlay. The sample baskets are also an example of how functionality and requirements has been aesthetically resolved as one smart solution. There are others too. 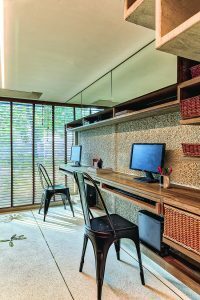 Like the wood-and-wicker panels that can be suspended near the workstations, should the staff area need visual privacy, with the denser work at the centre and the more porous work at the top and bottom. Similarly, the rounded junctions of the ceiling and walls (of the lower level) which are fitted with lighting to create a levitating effect, to alleviate the compactness of space. 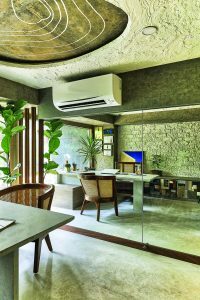 And the air-conditioner of the lower level which has been recessed into the ceiling such that its housing protrudes into the mezzanine and functions as the support for Prashant’s table above. 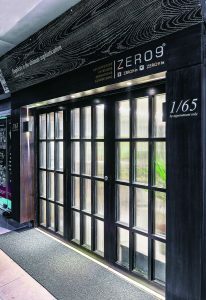 Zero9’s office shows smartness and stylishness operate independently of size and budget — all it takes is thinking out of the box. To create an efficient workspace that would exemplify how small samples can be tailor-made to specific requirements and create an impression at the same time. The entrance facade is a simple grid of fluted glass that gives suggestions of the interiors without betraying the whole narrative. 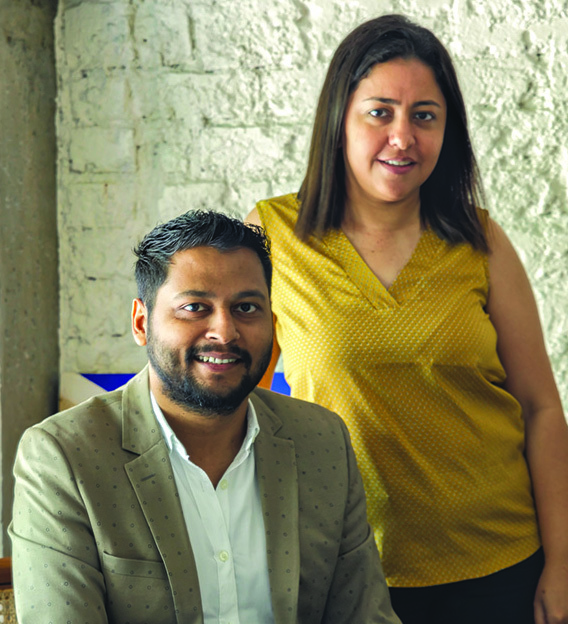 With the core thought revolving around a clean, clutter-free space, considerations of privacy needed to be smartly resolved. The architects thus created wicker and wood panels — porous on top and bottom, and dense in the centre for visual segregation only where required — that could be hung near the workstation. The compact dimensions of the mezzanine floor have been visually increased with the help of mirrors. There are two interesting details that exemplify form following function. One is the wooden fins near the window. The mirrored portion behind them is a separate plate, distinct from the rest of the mirrored expanse. As there was a possibility of the mirror near the window getting damaged (owing to moisture), introducing a distinct piece made replacement easier. The fins serve to conceal the joint between the two mirrored expanses, to maintain the illusion of oneness. The other detail is the base of the work desk, near the window. Part of this box-like support is actually the housing of the air-conditioner below, which is recessed into the ceiling of the lower level, and therefore protrudes into the volume of the mezzanine. 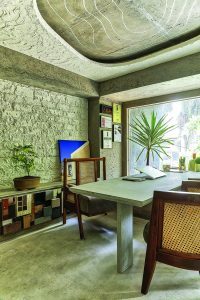 he internal aesthetic lends towards the raw and uncontrived, with expected details — such as unplastered painted bricks walls, machine-polished concrete, storage shutters that are actually removable mood boards, and brass foliage inlaid in terrazzo.